This month is again a Wargods month, we both seem to have a lot of these figures that still need painting. These are the Nekharu, the evil henchmen of the Wargods of Aegyptus Universe. 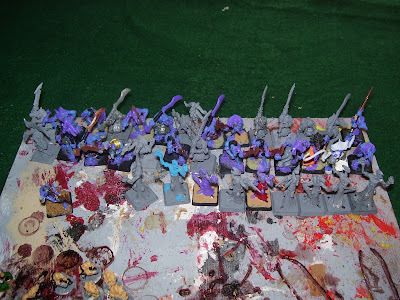 I have 37 to paint ready for August when I will be using them in the third part of the 'Searchers of the Lost Uraei' campaign, the second part of this will hopefully be played this week and pictures and a battle report will appear on the blog.